This raw/green mango chutney tastes best when it is made with a tart mango. 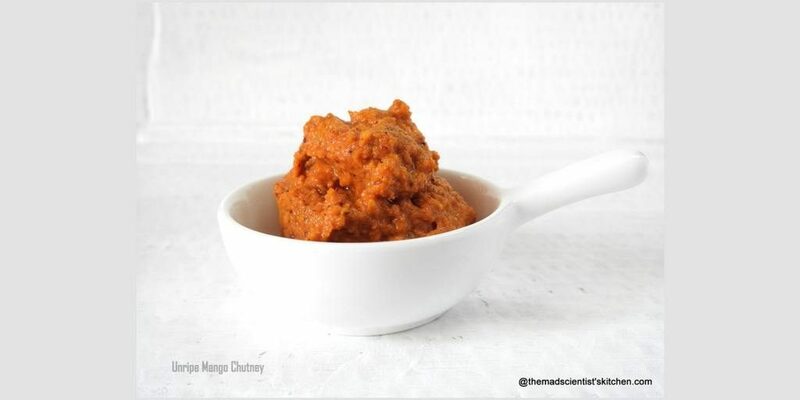 This is our family recipe and I know all of us make raw mango chutney just like this. This chutney preserves well in the fridge for about a week. However, I say this in the cool climate of Dharwad it stays for a week outside a fridge. I never lasted beyond that. At home, we put in the fridge and the bottle gets over in 2-3 days. My granny used to make a big Bournvita bottle full of this chutney for me when I was in the hostel. Chutney or “चटनी” or chatney or chatni , a sauce in the Indian cuisine. 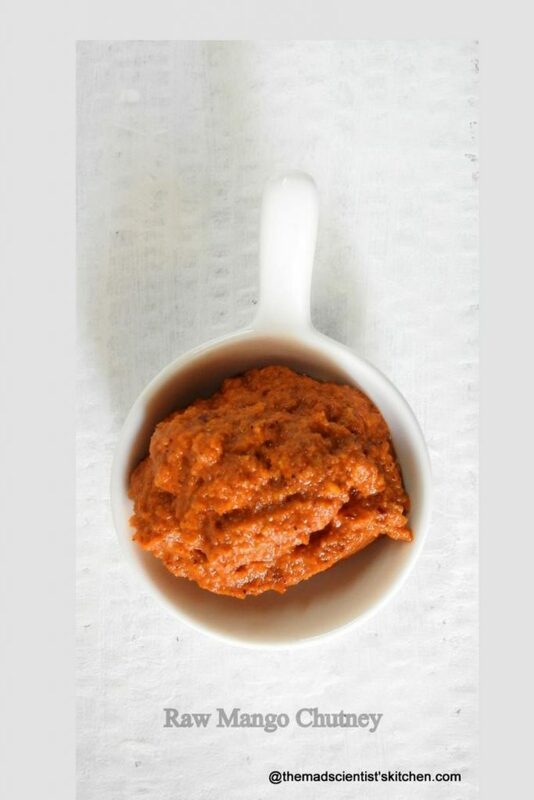 We have very many of them tomato chutney to peanut chutney with garlic, without garlic, from dry chutney to wet ones. Chutneys that can be stored to those that needs to be finished immediately. Main ingredients are dhania/ coriander leaves, capsicum, mint, leaves, sooth, coconut, onion, prune, tomato, red chilli, green chilli, mango, lime, garlic, coconut, peanut, dahi, green tomato, peanut, ginger, yoghurt, red chilli powder, tomato, onion. The spices used can be methi/fenugreek, dhania/ coriander seeds, jeera/cumin and hing/asafoetida. Here are some that I have tried in the past Lasun/garlic Chutney, Sunflower Seed and Garlic Chutney, Til ki Chutney, Curry Leaves Chutney, Cucumber Peel Chutney, Peanut, Coconut and Onion Chutney, Kavalikai/Karvanda che Chutney, Green Chutney, Green Chutney for Chaat, Dates Chutney, Tamarind Chutney. Some of the raw mango dishes I have tried are Keri ki Launjee/A Raw Mango Preserve, Mixed pickle of Raw Mangoes, Cauliflower and Carrots, Raw Mango in Salt, Raw Mango Rice, Panha-Raw Mango Drink, Gor Keri a Raw Mango Sweet Pickle, Ambe Dal, a Salad. In today’s fast and commercial world, however, we prefer store bought chutney and pickles. The disadvantage of these commercial chutneys is the use of vinegar and sugar. Sugar and vinegar though a preservative and the use of these relishes can add to total sugar, consumption which can be harmful. Once they splutter, add the hing/asafoetida and methi/fenugreek seeds and switch off the gas. In the mixer mix all the ingredients and grind to a fine paste using water if necessary. The best taste is when you eat chutney mixed with rice and ghee. Looks so good..love the flavor of raw mangos..
yummy chutney !!! loved the texture !! Am drooling all over it..love love love this chutney..YUM!! yummy ….all time fav with kanji…BTW archana, thanks for trying out…ofcourse I will be delighted to see ur post on that..also…why dont u try my garlic rolls…it is a the most fluffiest and soft rolls….and it wont go wrong also….just use instant yeast…any help….ping me. And yes..you can definitely post it .. I will do this same.but adding jaggery is different. Delicious and droolworthy chutney. Thanks for sending.. Superb Looking Chutney, Arch — am drooling! Chutney looks delicious. Now soon it will be mango season here. I will make it. 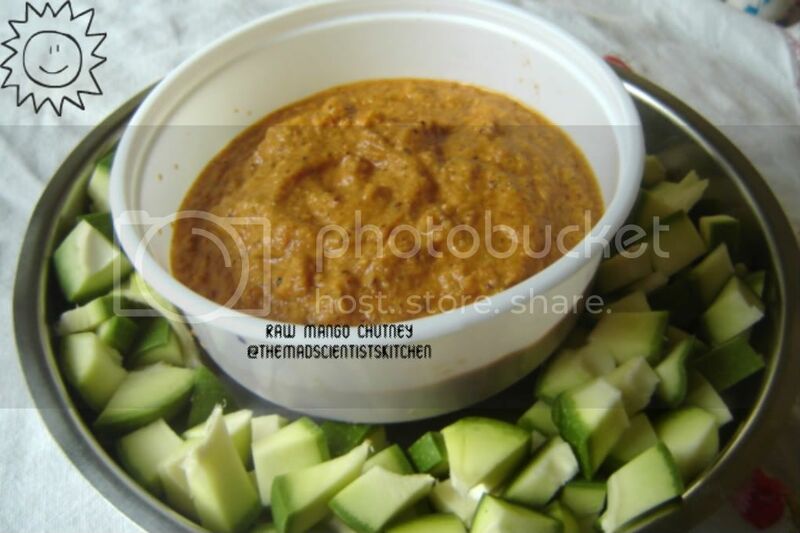 Lovely raw mango chutney – so easy to make too. I’m eagerly waiting for the mango season to try these yummy dishes. The recipe sounds so mouthwatering, have to try it soon , thanks for the lovely share. I make a similar chutney with fresh coconut and raw mango. Will try this one soon as well as I love the taste of Khobra. Fresh coconut and mango chutney is delicious too. We all have different ways of making mango chutney, love your family version. Looks super tempting. I still prefer to make chutneys at home as ready made ones taste awful and will have preservatives in them. True Mayuri we prefer homemade chutney. What a lovely chutney, it would be perfect to serve with indian snacks . Its hard to get mangoes in Uk but will source them and try this revipe. Absolutely tempting chutney… Love the fresh flavours in it and feel like having with hot plain rice. Yummiest combo in the world.Drooling. Mango chutney in any form is yummy. Lip smacking good! Your post has opened up floodgates of childhood memories for me. I learnt to make raw mango chutney from my grandmother. We add mint and green chillies to it. What I love about yours is the addition of coconut, jaggery and methi. This is a completely different flavour profile and sounds delicious. ???? I will try to make it the way you make. Sure will love it. Omg the raw mango chutney looks divine. I am going to try it as soon as I get the raw mangoes. The chutney pics itself is tickling my taste buds. So yum???? My nani used to make baby nimbu ka achaar for me when we used to go for summer vacations ???? Yummy I love any kind of achaar. Is it on your blog? You are so true about store bought chutneys and the preservatives. Its always best to make small batches of fresh chutneys with seasonal produce and enjoy just like this gorgeous raw mango chutney. Spicy, tangy and delicious. I loved that cute white pot in which it is served as well. Great share! True Jayashree, try it on bread too. Yum! 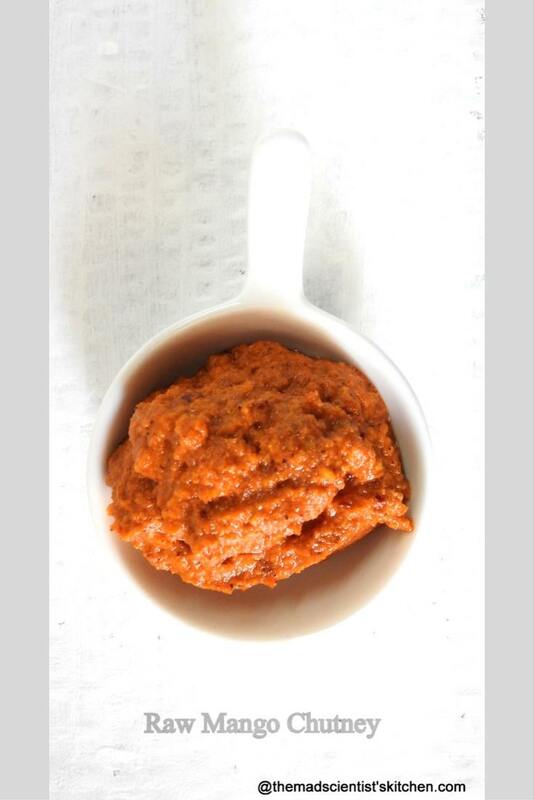 raw mango chutney the colour itself tempting to have a plate of idli.. so delicious..
Must try using green chilli. Memories are always built in Bournvita and Horlicks bottles back home, isn’t it? 🙂 This looks so good to be scooped up with some paratha and settled up with some yogurt… slurp! True I still hoard the last few of my MIL’s glass bottles. Mangoes make me homesick, now. I miss the variety and the fun. So sorry maybe you should come down for a holiday.